Starting a Business While In Debt – Should You Pay off Your Student Loans First? Ever since I was younger, I had the idea that I was going to go to college and get a degree. Which one? Who knows, but the piece of paper was the most important thing. When 16 rolled around, I had no idea what I wanted to do with my life, but I started looking at colleges because that’s what you did. My requirements for schools were minimal – they had to be in a really cool place and not too hard to get into – my self-confidence was pretty low at that point – and that was pretty much it. After a senior trip to the Marine Lab in the Florida Keys, I ended up deciding when I was 17 that I loved marine biology – so I wanted to go to school for Marine Science. I loved the ocean, boats, sea creatures, and thought it just made sense. They were one of the places that offered a Marine Biology degree, and heck, they were in Myrtle Beach. That’s a cool place, right?! It helped that my parents were moving to Myrtle Beach when I graduated because my stepdad was opening a restaurant down there. My mom raised me as a single parent and we are extremely close so that really helped me make the decision. Plus, them moving to the same state the school was in meant that I would get in-state tuition. As I mentioned before, my mom was a single parent and just didn’t have the money to put me through college. Student loans were pretty much the only option I had – or thought I had at the time. The first two years of college I took out the max I could, about $14k each year, even though my tuition was about half of that. Hello, $28,000 in student loans! I worked at Planet Hollywood starting my second semester because I needed money. But I didn’t use the money I made for school or anything. What did I do with it? I’d say 90% of it I spent on beer and eating out. But heck, I needed a social life right?! I had NO CLUE about personal finance. It was never a topic that was brought up at home or school. At the time I applied for loans, I remember not even being worried about them because the concept of debt was so foreign to me. If I had known I would still be paying these back 10-12 years later, I think I would have second-guessed that option. After my first semester, I realized that this whole biology thing was too tough for me, and I was not motivated enough to stick with it. 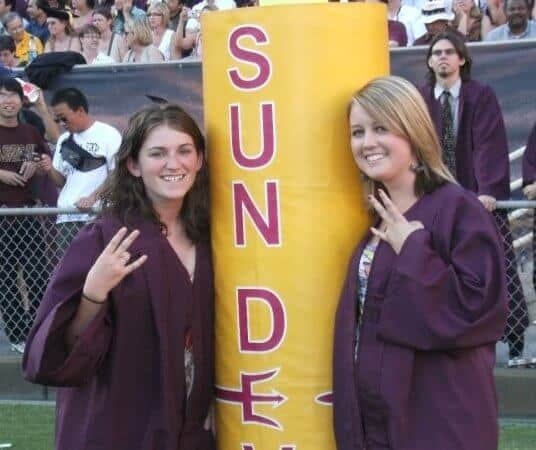 Arizona State University was far away – which I was excited for – and offered a Geography degree so it was perfect, right? I LOVED Arizona, the school, the people and all. But out-of-state tuition the last 2 years of college brought my total student loan debt to $72,000. I graduated with a Bachelor of Science degree in Geography. Mind you, I still had NO CLUE what I wanted to do with my life. I ended up moving back to the New Jersey/Philadelphia area and started looking for work. I waited tables at a Red Robin burger shop for about 6 months before I found a full-time job. I finally got a full-time job and started settling into the 40 hour work week, learned about 401k’s and at that point, I got kind of interested in personal finance. But it wasn’t until I found the Smart Passive Income podcast in 2013 that I learned about online marketing, making money online, and blogging. I ended up starting the first version of this blog, then called Bright Cents, to write about paying down my student loans. I made great progress paying down my loans, paid off about $30k in 21 months – because I kept track of everything using debt reports. But after about a year and a half of solely focusing on paying down my debt, some big life changes happened including a breakup, I realized I wanted to try out this whole entrepreneurship thing. So instead of putting all my extra money towards student loans, I started saving it. I was saving up enough money for a “runway” AKA emergency fund that would support me for about 8 months if this whole entrepreneur thing didn’t work out the way I planned. Once I had that money saved up, I was ready to venture out on my own. But as you probably guessed from this story so far, I still have student loans and have already quit my day job. Should You Pay Off Your Student Loans Before Going Into Business? How did I decide it was okay to quit before paying off my student loans? This was a tough decision, and required a lot of thinking and analyzing. 1. Build Up a Solid Emergency Fund – Do you have enough money saved up to cover these payments? I determined what I needed each month to pay all of my bills, and made sure to include about $50 extra on top of my normal student loan payment, just to be safe. Here’s a free calculator to help you figure out the amount you should save. Then I started a separate bank account just for this money to make sure it was clearly labeled what it was for, and I wouldn’t touch it to pay other bills if I didn’t have to. When I was building out my emergency fund, I create a few different accounts to keep track of what each bucket of money was for. I combined my student loan and health insurance bucket. Then I give each account a nickname so I remember how much I decided I needed to save for that purpose. I’ve mentioned this before in my post about how I track of all of my bills, and use the same naming convention as well. You only get a certain number of characters with bank account nicknames, so this might be confusing to an outsider. Essentially, I needed to save $4,800 for my health insurance, and $2,400 for my student loan. The minimum payment on my student loan is $200, and as I mentioned before, I saved a little extra too to create an additional buffer, thus the $2,400 instead of $1,600. The “7.2k” stands for the total needed in that account before it was fully finished: $7,200. I still have this account live and accruing interest because, while I haven’t had to dip into my savings yet, I’m not confident I’m out of the bloody water of business just yet. This is a big thing to consider, because some options may be more flexible, while others are not. Here are some details about your loans to take into consideration. If you have Federal loans you may be eligible for loan forbearance. This means you can temporarily stop making payments or at least reduce them for a while. If you have private loans, you have no such option, sorry. This means that you really need to nail down your emergency fund and make sure you have enough saved before making the jump. If you have fixed interest, you can more reliably predict your monthly payments moving forward. For those of you with variable interest, you’re going to want to save quite a bit extra in case interest rates start rising again and your minimum payment increases. If you got your student loans like most people between the ages of 18 and 21, you probably needed a cosigner to even qualify. I know I did. But when making this big of a decision, you have to take this person into account. If you default on your loans and can’t pay them, that cosigner is going to be held liable for making the payments. Don’t screw them over because you wanted to try this out. 3. How Much Income Do You Have Coming In? If you’re not bringing in money yet, I’d highly suggest figuring out the income piece before leaving your day job. Without income, you’re almost definitely going to have to dig into that emergency fund/runway your first month, meaning you really only have 8 months before you run out of money. For some people, it takes that long to find a job. So it would be worth it to get this squared away before taking the leap and going out on your own. Figure out your business plan, where money is going to come from, and how long it will take you to be making as much as you are at your day job. If you’re like me and you decide that you still want to move forward with quitting your day job before you’re paid off your student loans, here are some things to consider. Just because you’re making your own money, are able to make all your payments on time, and are watching your income grow, do not think you’re out of the danger zone just yet. Until you’re able to pay off your loans, you should always be finding ways to make extra payments, so that if tomorrow your world crumbles, you won’t find yourself with collections agencies harassing you, making your failure even more unbearable. I am currently paying $550 a month on my loans, even though my minimum is $200. I have a variable interest rate which I’ve seen increase already since I left my day job, so I am trying to get these paid off faster. Sure things might be going well at this point, but what happens when you hit a wall – or your business income declines? I definitely recommend always having an emergency fund, and always having money set aside in that fund for your student loan payments. Better safe than sorry in this case, considering student loan debt is NOT covered if you file for bankruptcy. Yep, you’re stuck with that ball and chain until they’re paid off. I’ve felt this happen already – I am making more money, so I can afford this X, Y, Z tool or going out to eat every once in a while. But sometimes, you’re not really able to afford that stuff yet. I’d argue that until your student debt is paid off, you’re not able to afford anything above and beyond what you truly need to be running the business. And you should be focused on building a solid foundation before adding extras to your business. A solid foundation includes no personal debt, so you’re able to fully focus on one financial outcome, and that is building a strong business. Until you’re out of debt, you should be looking for ways to save money and cut back on expenses in all areas of your life. This includes business expenses, especially for people who are running their business as a sole proprietor in the beginning. If you decrease your business expenses, you increase what your potential income could be. Saving money on business expenses can also help you get more creative in making those savings translate into your personal expenses. 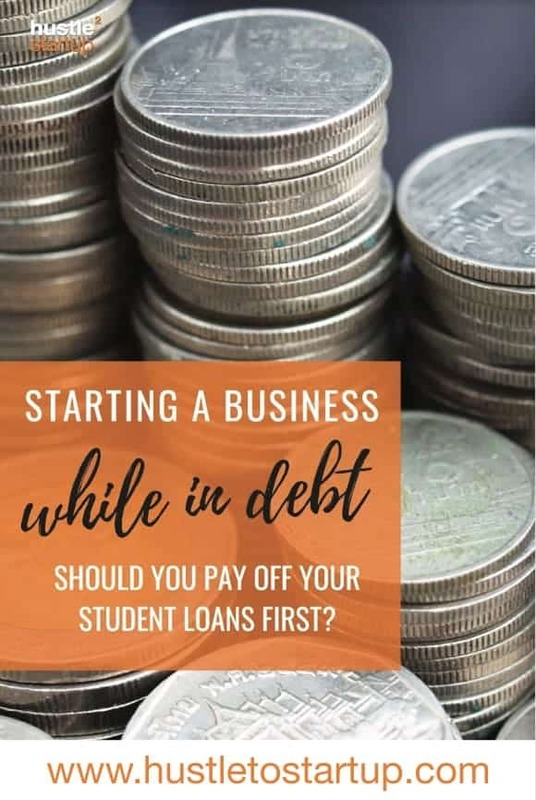 All of this boils down to one thing: if you are thinking about starting a business but you still have student loans, you need to get REALLY clear on your current financial situation. If you decide to move forward, figure out how much of a runway (aka emergency fund) you’ll need to reduce the stress around money. If you have kids, take them into account when making this decision. To help you get started figuring out how much you should save for your runway, I’ve created a calculator to help you out. You can grab your free copy of the runway calculator here. Found you on the College Investor site’s Student Loan Debt Movement. I relate to this all too well right now. Alas for me, my business isn’t generating enough revenue yet for me to pull out a salary so I’m living on my emergency fund. Like you, I built it with student loan repayment included. I’ve lived off of it for two months thus far and am now seriously pursuing side hustles to bring in income until my business grows. Thanks for letting me know I’m not alone. Absolutely, glad to hear you can relate to this experience. What kind of side hustles are you working on? Are you getting close to pulling in a full salary from your business?